After years of hype surrounding the build and production of electric cars, a new era in clean technology within the automotive industry has arisen. With leading manufacturers such as Mercedes-Benz, Honda, Lexus and Audi all announcing hydrogen powered concept cars set to be released within the next few years, 2016 is gearing up to be the year of the hydrogen car. A range of announcements and sneak peaks of concept cars from leading car manufacturers have been announced so far this year. The North American International Auto Show (NAIAS) 2016, which was held in Detroit from January 11 to January 24, was a virtual show ground for hydrogen concept cars. Amongst the array of automotive industry news and the showcasing of new vehicles, there was a particular spotlight on hydrogen fuel cell vehicles and their technology. What are Hydrogen Fuel Cell Cars? A Hydrogen Fuel Cell Vehicle (FCV) runs on hydrogen instead of the typical petrol or diesel that most cars run on. A FCV utilises a fuel cell, which combines hydrogen and oxygen as a chemical reaction to convert to energy. The electricity, which is produced from this process, is then used to run the vehicle’s motor and produce the driving power for the car. When using hydrogen fuel cell technology, a bank of fuel cells is sufficient to power a car for hundreds of kilometres and can be refuelled considerably quicker than an electric car. Not only do hydrogen fuel cells burn clean, but their only by-product is is water. The manufacturers of FCV’s strive to provide consumers with a cleaner, greener motoring option than what is currently available in the market. FCV’s don’t emit any harmful substances into the atmosphere such as carbon dioxide, sulphur dioxide or nitrogen oxides, which means they are completely emission free when driven. If the hydrogen that is used within a FCV can be produced without carbon dioxide emissions, the vehicles would then represent a completely clean motoring solution. Hydrogen is continually being researched as a clean energy replacement for other sources of power. In the automotive industry, hydrogen fuel cell technology is gaining more traction to become the forefront of potential clean technology. Battery Electric Vehicles (BEV) utilise electricity, which is stored in a battery pack. The power stored in these batteries is then used to power an electric motor, which powers the car. When the energy is depleted, the batteries are recharged either from a wall socket, or a dedicated charging unit which can be found throughout many major cities within Australia. FCV’s are a new type of electric vehicle that utilises a fuel cell to generate electricity, rather than storing energy from another source (like household power) in a battery pack. Though FCV’s are similar to electric cars, the driving range between the two types of vehicles is the most notable difference. A typical FCV carries roughly 5kgs of hydrogen fuel, which gives it a driving range of about 500km. This range is comparable to a traditional petrol or diesel-fuelled vehicle. In comparison, an average battery powered electric vehicle generally only has a driving range between 65km and 160km. Differentiating factors such as size, model and refuelling location affect the time it takes to refuel an electric or hydrogen fuel cell vehicle. On average it takes between six and eight hours to charge a typical electric car through a standard socket connection. 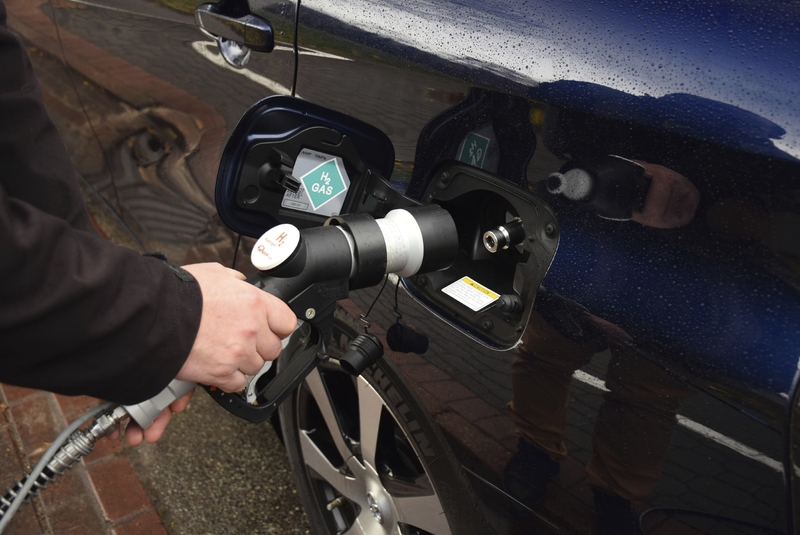 Through testing it has been reported that it only takes between three to five minutes to refuel a FCV at a dedicated refuelling station. Although hydrogen makes up approximately 75 per cent of all mass within the universe, as a pure element hydrogen does not exist naturally omn earth, and must be synthesised from other materials. Currently there are two viable approaches to manufacturing hydrogen – hydrocarbon reforming, and electrolysis of water. Due to costs and practicality reasons, the overwhelming majority of global hydrogen is currently manufactured from hydrocarbons such as coal, liquid fuels such as diesel, or from natural gas. The generation of hydrogen from hydrocarbons result in significant carbon dioxide emissions. In fact, the carbon dioxide emissions associated with the production of hydrogen in this manner is greater than using hydrocarbon fuel directly. The production and use of “clean” hydrogen with a lower carbon dioxide footprint would offer a long term, sustainable and green motoring solution. Though hydrogen fuel cell technology offers a greener alternative than petrol or diesel, which is used in current vehicles, there are limitations, which affect its future implementation. Hydrogen fuelled vehicles require refuelling infrastructure, which is currently unavailable in Australia. With the announcement of concept hydrogen fuel cell vehicles in 2016 by so many leading manufacturers, infrastructure may begin to be produced to keep up with the potential growth in demand. Do you have any thoughts of hydrogen-powered vehicles? Let us know in the comments below.